When I decided that my future was investing in and operating online businesses, there was one huge problem I encountered. I couldn’t find good data to help define the relevant universe of opportunities. After wasting an enormous amount of time I ultimately stumbled upon Jock Purtle at Digital Exits. Jock and his partner Robert Kale publish an amazing historical summary of valuations for all different monetization methods. Below is their most recent edition covering the last 10 years! 1. The size of market transactions is growing but still small enough to be off the radar of Institutional money. Most transactions are less than $250,000. 2. Ecommerce is the largest category and a consistent performer with a large volume of businesses selling, and growing fast. It is, in my opinion, the easiest business to understand and train a new buyer on. With the ease of platforms like Shopify, they also often require fewer hours per week to maintain, and the owner can focus on marketing and growth. 3. Jock and Robert believe the reported numbers only capture 10-15% of total transactions. Most deals are done privately. How do you plan on accessing the 85%+ part of the deal flow? So make your plans to can get involved in this exciting asset class and remember, you’re just a deal away. What Will it Cost to Buy an Online Business in 2018? Originally posted at Digital Exits. In 2008, we started analyzing all online business transactions that we could find for the previous year, and presented it in a report to help online business owners, like you, sell your website. 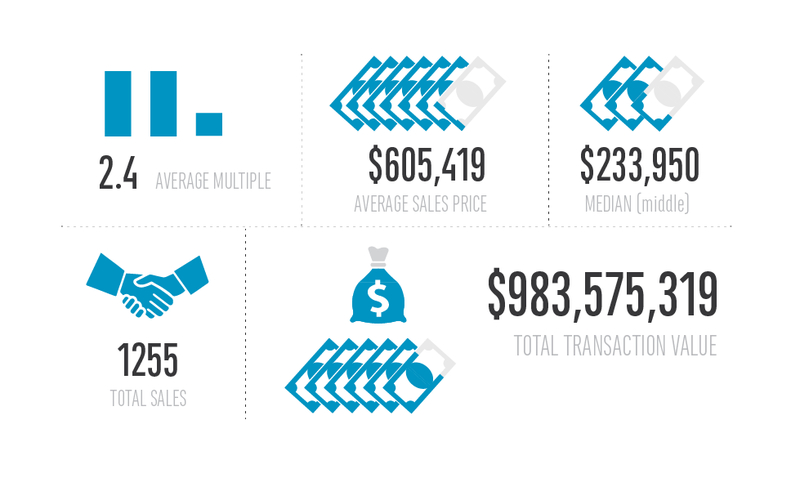 Each year, we analyze the previous year’s sales to come up with industry averages. Fast forward to today, and this article represents a sales data analysis of the 10 years from 2008 to 2017. What is also discussed and needs explaining is when we say, for example, a “multiple of 2.44x.” What this means is: the amount paid for the business is a value of 2.44 times the profit (SDE). EXAMPLE: A business that is doing $300,000 in profit per year that sold for 2.44x means the selling price was: $300,000 * 2.44 = $732,000. This works in reverse as well. If a business sold for $723,000 at 2.44x, then (2.44 = $732,000 / 2.4x means the profit was $300,000). Note that the SDE is typically calculated for the trailing twelve months (TTM) of the business. For this report, we analyzed 1,255 businesses that sold from 2008 to 2017. 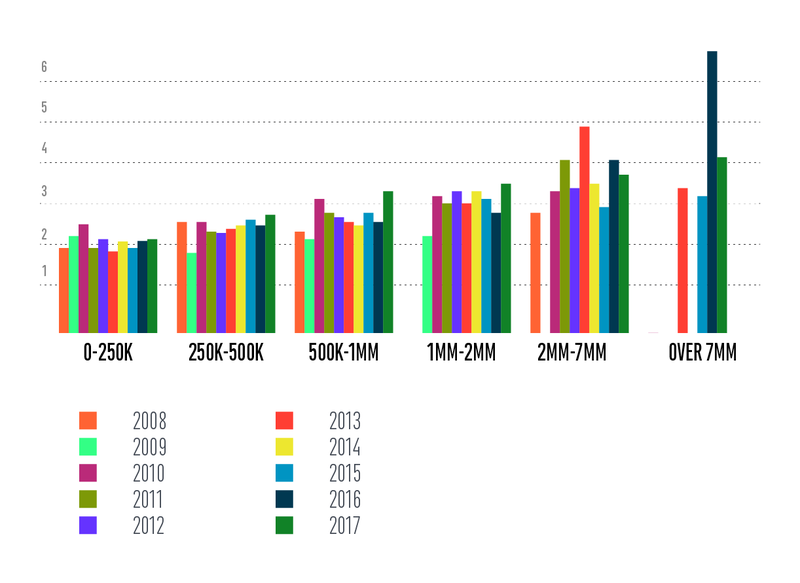 What we’re seeing from the data is a steady increase year-over-year in the average multiple of an internet business sale, and a significant increase in the recent 2017 multiples. Also the market as a whole is growing. Total deal volume was $483 million in 2017 versus $116m in 2016. Also noteworthy for 2017 is a large spike in sales of ecommerce businesses – both standalone websites like those run through Shopify/BigCommerce platforms, as well as Amazon storefront businesses. The software category fetched the highest average multiple, with a 2017 annual average of 3.16x. This graph breaks down the percentage of the total deals each business category represented. Ecommerce FBA – a storefront on Amazon, including businesses that hold inventory through Amazon FBA or ship inventory themselves or through other means. Where Can You Sell Your Online Business? Smaller business and micro-businesses are usually best sold privately by the owner through forums or classified websites.To sell your small business, check out Flippa. Medium sized businesses making between $250,000 and $20m in profit are best sold through brokers who help with finding buyers, negotiating and structuring the deal, we recommend Digital Exits. Larger businesses making over $20m in yearly profit are best sold through investment banks or merger and acquisition companies. To sell your large business, check out BusinessExits. This graph represents a snapshot of the total data. It will give you a better understanding of where your business sits in comparison to all the businesses analyzed. The average multiple for all businesses sold in those 10 years is 2.5x. The sum of transactions between 2008 and 2017 is $983 million. 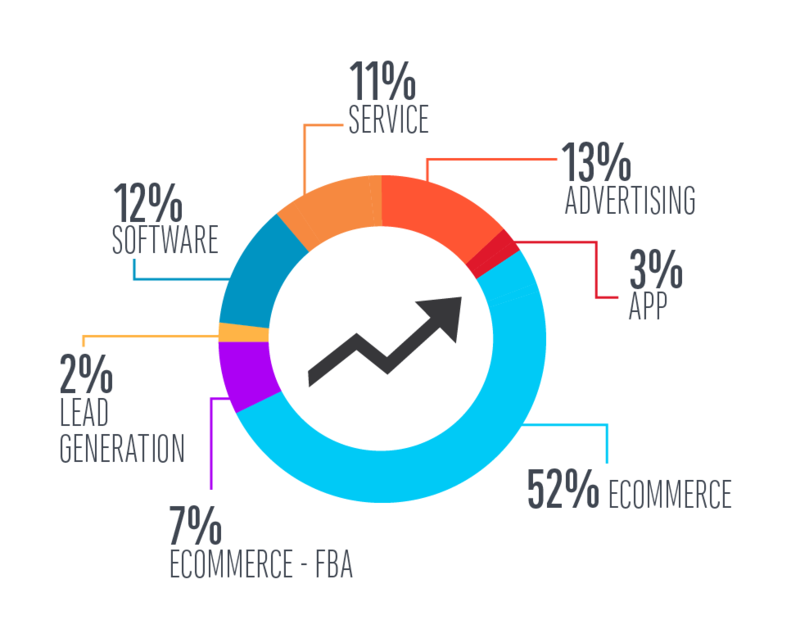 We believe this represents only 10-15% of the overall market of traded web businesses. The rest are either partner buyouts, employee buyouts or private transactions. WHAT IS THE AVERAGE MULTIPLE PER BUSINESS MODEL? 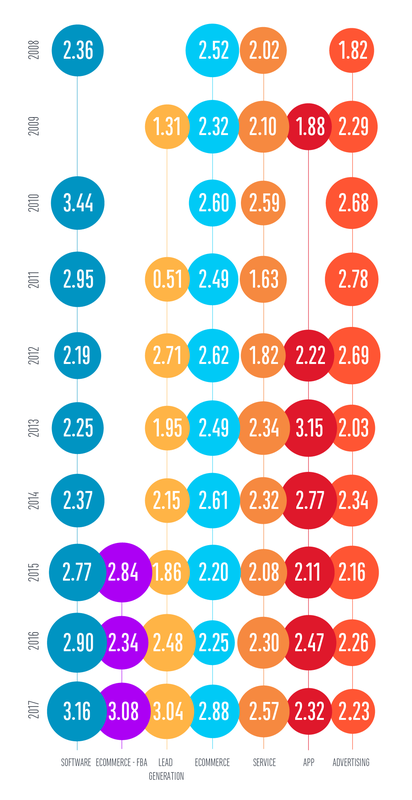 Now that we have 10 years of data, we can see how the average multiple has changed annually. Advertising – Demands a low multiple because you also don’t control the customer. Essentially, advertising websites drive people to their website with the goal to send them away to another source. App – The barrier to entry is too low and the ability to acquire customers is extremely hard where businesses grow extremely fast and then die (cite: candy crush). The Advertising and App categories were the only two categories that saw a decrease in average multiple from 2016 to 2017. Ecommerce – A consistent performer with a large volume of businesses selling, and growing fast. It is, in my opinion, the easiest business to understand and train a new buyer on. With the ease of platforms like Shopify, they also often require fewer hours per week to maintain, and the owner can focus on marketing and growth. Ecommerce FBA – The fastest growing segment. Amazon-based businesses, however, overall demand a lower multiple than standalone ecommerce websites. This is mainly because the business owner does not “own” the customers – Amazon does. Also, there is always an inherent threat of Amazon competing with the business, adding more risk for the buyer. That being said, we’ve seen a sharp increase in the number of Amazon business sales in 2017 and we expect more transactions in 2018, so they are still attractive to buyers. Lead Generation – A surprising performer over recent years. As more competition comes online it has been harder to generate leads for businesses and thus the higher demand for leads. Service – Again, a consistent performer and also easy to understand business. The main value in a service based business is the book of clients which can be transferred easily, and if they stay on as clients it can lead to a decent return for a buyer. This category also saw a significant average multiple increase year over year: 2.3x in 2016 versus 2.57x in 2017. Software – Still a very highly demanded business model and the biggest winner in terms of multiples in 2017. We saw another average multiple increase here year over year, from 2.9x average multiple in 2016 to a 3.16x average multiple in 2017. There seems to be a large gap between low 6 figure valuations and million dollar valuations for software businesses. I think the market is finally starting to wake up to the value of recurring businesses and pay the multiples that they deserve. ARE SMALLER OR LARGER BUSINESSES WORTH MORE? We can see from the last 10 years the consistent trends of multiples at each price point. The larger your business, the higher multiple you can demand. For example, in 2017 the average multiple for a business that sold between the price of 0 – $250k was 2.15x. However, if your business was worth $2M – 7M, the average multiple was 3.85x. This will give you a pretty accurate range of where you business sits in the valuation spectrum. HOW MANY TRANSACTIONS OCCURRED AT EACH PRICE POINT? This graph represents the total number of transactions that occurred in each price range. For example, in 2017, there were 133 transactions in the $0 – $250k range. Similarly, there were 75 transactions in the $250k – $500k range. This data represents the volume of transactions at each price point. Obviously, there will be more transactions of “smaller” businesses in the $0 – $500k range, and less supply of businesses at a higher valuation range. Whats interesting to note is the growth in larger businesses being sold ($1m – $20m selling price). WHAT DO THE MULTIPLES LOOK LIKE ON A SCATTER GRAPH? 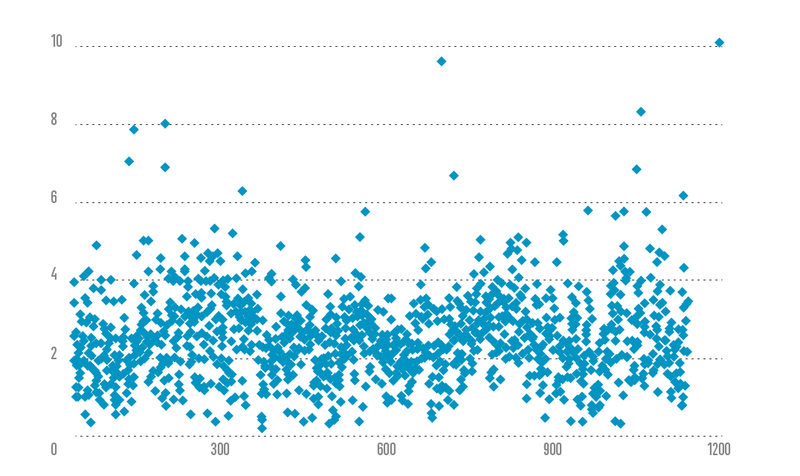 To get a true appreciation of averages you need to look at the dataset as a whole. This scatter graph represents each transaction and what multiple it sold at of profit. What you notice is the majority of transactions falling in the 1.52X to 2.24X valuation range. This data backs up the premise that most small businesses sell for 2-3 times earnings. About the author: Jock is an internet entrepreneur who specializes in the buying/selling and appraisal of online businesses. He loves the freedom and flexibility of internet companies, and he encourages people interested in them to get involved as much as they can. While he’s still a long way from retirement, he’s helped many individuals acquire companies that have helped them live worry-free long after they’ve stopped working full-time.